British beaches are often portrayed as long strips of white, sugary sand enclosed by frothy water on the one side and greenery on the other. Chesil beach is different. It has a rustic feel with its shingled surface and windy atmosphere. Nonetheless, tourists consistently rate Chesil as part of UK’s top 10 beaches. The award-winning romantic film, On Chesil Beach, is only fitting to this unspoilt beauty. The Chesil bank, after all, looks majestic with the four elements playing together, creating a symphony– the shingle, the sea, the wind, and the sunny sky. Located in Dorset, Southern England, the Chesil Beach is commonly mistaken as a tombolo because it is connected to a mainland, that is the Isle of Portland. But geographers discovered that it is actually a barrier beach, protecting Weymouth from harsh winds and ravaging waters, that rolled inwards. This 18-mile pebbled stretch is also part of the infamous UNESCO World Heritage Site, Jurassic Coast, which covers Dorset and East Devon. Chesil Beach is also the title of a famous book by Ian McKewan, which was recently turned into a cititcally aclaimed film. Many of the film’s scenes were shot at Chesil Beach and neaby. 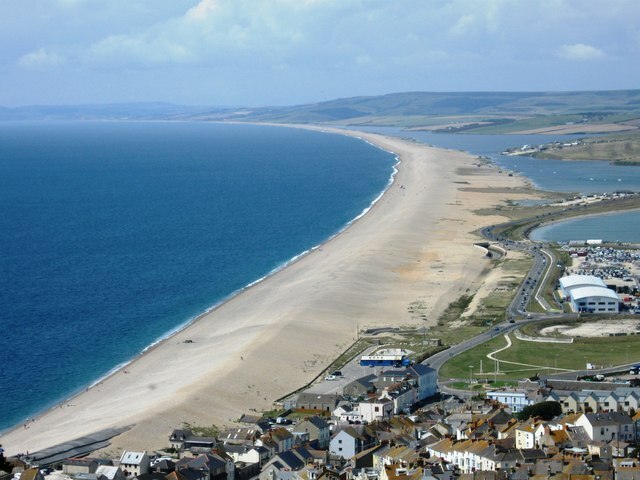 The Chesil Beach runs 28 kilometres (or 18 miles) in length and 160 to 200 metres in width (depending on the tide), connecting West Bay in the north to Abbotsbury and then to Portland in the south. The area is blessed with about 180 billion pebbles that vary in composition (e.g., quartzites, cherts, flints, etc) and sizes (fist-sized to pea-sized). The stone texture in West Bay is finer than in Portland. Car parks are available at different stations (e.g., Visitor Centre, Moonfleet, Abbotsbury, West Bexington, and Cogden). Among the popular ones are the Visitor Centre, West Bexington, and Abbotsbury. All three have cafes, parking lots, and restrooms for personal necessities. Some have viewing decks for tourists to conveniently check the horizon and relax before exploring. The Chesil Beach can also reached by train from Dorchester or by bus from King’s College, Cineworld, Sandbanks beach, and Tesco. Hiking is obviously a must-do when in Chesil Beach. Because of the pebbled trail, sturdy closed shoes are recommended. Other access points like the Burton Bradstock and Cogden have wilder natural formations that may not be appropriate for children but they’re perfect for the physically active and the adventurous people. Visiting the Abbotsbury swannery is also a must-do. It boasts of more than 500 swans seeking refuge in the Fleet Lagoon. Those wishing to destress by filling in their senses with nature’s goodness can explore the entire Abbotsbury Subtropical Gardens, which is a 20-acre treasure of exotic plants and trees. Diving and other water activities in Jurassic Coast are also available to those who seek aqua adventures. Furthermore, a pack of restaurants and cafes with different food offerings is present in Portland, the reason why a typical Chesil trip has become a food and social affair. Since the beach gets crowded during summer and autumn, you may want grab the opportunity to socialise and meet new friends. At the southernmost part of the beach strip is the Chesil Cove, which attracts novice divers because of the shallow waters. Beach hoppers can also jump from Chesil to other equally stunning nearby beaches such as the Isle of Portland, Jurassic Coast, Sandbanks Beach, and Weymouth Beach. Nearby attractions like the Portland Lighthouse, Jurassic Skyline, and Portland old castles are welcome to tourists who prefer land discoveries.